Paul Pogba provided some fascinating insight into how things have changed for him at Man Utd since Ole Gunnar Solskjaer replaced Jose Mourinho. The Frenchman was struggling to hit top form in the first half of the campaign, as he was even dropped to the bench on occasion by Mourinho prior to the Portuguese tactician’s departure last month. 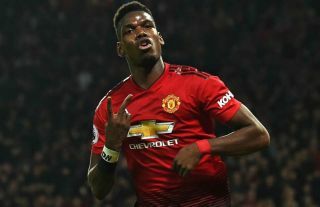 Since Solskjaer was appointed interim boss, Pogba has contributed four goals and four assists in his last five Premier League outings, with the Red Devils going on to win all those five games. As noted by The Guardian, the World Cup winner even admitted at the start of the season that he wasn’t happy, but clearly now playing in his favoured role and flourishing, that happiness has returned as has his ability to be decisive for Man Utd. “I am enjoying playing football it was really difficult with the system and tactics we used to play,” he told Sky Sports, as quoted by the Manchester Evening News. While on one hand it would be easy to criticise Pogba as ultimately given the quality that he possesses, he should be able to contribute in both facets of the game and put defensive work in too. Nevertheless, it could also be argued that in order to get the best out of him on a consistent basis, it’s up to his manager to put him in his most effective role, something that Solskjaer has clearly done and has perhaps even built around him to ensure he makes the difference for his side. Pogba is currently leading United’s charge up the table as they now look a real threat to their rivals to fight for a top-four finish. Solskjaer is getting the best out of him, and that should also quieten rumours of an exit, with Tuttosport noting in the week that he is still wanted by former club Juventus, as per their front page in the image below.